When we first started work on NEXTFREE late last year, one of our driving goals was to make it as easy as possible for Freelance Contractors and Consultants to keep Clients and Recruiters informed of their availability. Our fantastic group of Beta testers has been helping us prove that there is a demand for this capability from both the freelance community and from the client and recruiter community. One of the biggest challenges we, as a service, face is making sure that our Freelancers keep their NEXTFREE date current by remembering to change it if their circumstances change. This week we’re introducing Reminder Emails to help do just that. Freelancer Reminder Emails will be sent out automatically as a NEXTFREE date approaches, checking that a freelancer will still be available on their set date. The email offers an option to reset it to some custom date when things have changed. Or, to make updating as painless as possible, the email also includes quick update links that allow Freelancers to add one week, one month or three months to their existing NEXTFREE date with a single click. 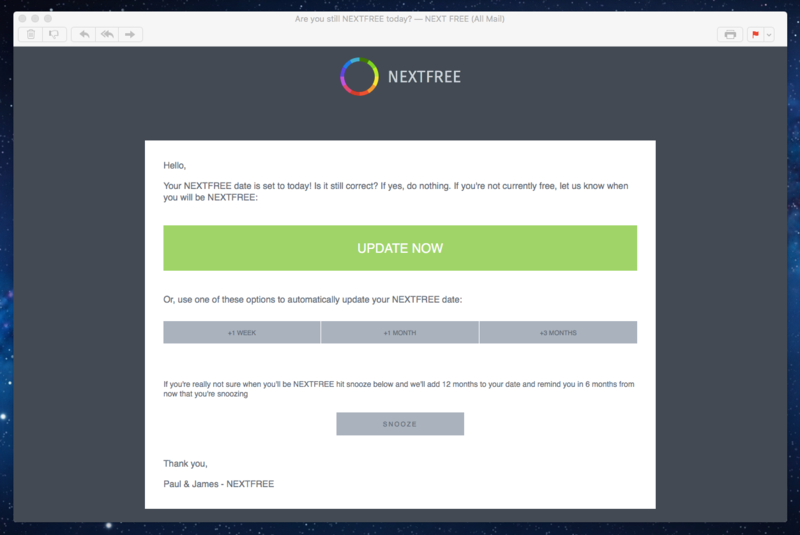 Selecting one of these quick update links will take a Freelancer to the site and, if already logged in, will automatically update their NEXTFREE date for them with no further action needed. We think this feature will make keeping NEXTFREE dates accurate much easier, which in turn will help improve the data we can provide to potential clients and recruiters and increase the usefulness of the tool for everyone. Win win, win. Every now and then a Freelancer will come across a contract or project that doesn’t have a set “end date”. For these folks we’ve included one additional option in the Reminder Emails; “Snooze”. Selecting Snooze sets a Freelancer’s NEXTFREE date to one year in the future and sets a flag in our system to email them again 6 months from now to check that they still wish for their account to be in snooze mode. This allows those who aren’t sure when they’ll be NEXTFREE to not have to worry too much about setting an accurate date but to continue using the service. We think Freelancers will love our new Reminder Emails, but we know we’re still learning so if you have any thoughts on our updates or any of the rest of what we’re doing at NEXTFREE, please drop us a note on Twitter @NEXTFREE or email us at support [at] nextfree.co.uk. NEXTFREE is changing the way Freelance Contractors and Consultants share their availability with the World. If you are a Freelance Contractor or Consultant and would like to try our service for free you can sign up for an invite to our Beta program at Freelancer invites. If you hire Freelancers and would like an early invite to our Recruiter Beta program when it starts (in the coming months) sign up for an invite at Recruiter invites.